The Yankees lost 4–2 yesterday, despite a complete game from CC Sabathia and the fact that their infield turned a triple play — the team's first since 1968 — in the sixth inning. But the real fun happened on an otherwise insignificant foul ball by Robinson Cano and in the postgame remarks by Oakland pitcher Dallas Braden. Cano hit a blooper down the left-field line that landed just foul. Alex Rodriguez, who was on first, started to round the bases, and on his way back to first, stepped on the pitcher's mound — an act Braden took offense to. Braden said that A-Rod had broken one of baseball's unwritten rules, albeit one hardly anyone, except for Braden and this guy, has ever heard of. (Neither the YES announcers nor Oakland's CSN announcers had any idea what Braden was upset about. In fact, the CSN booth thought at first Braden was yelling at the second-base umpire.) Braden told A-Rod to "get off my mound," then took seven minutes after the game to rip A-Rod to reporters. For stepping on the pitcher's mound. Via the LoHud Yankees Blog: "I don't care if I'm Cy Young or the 25th man on the roster, if I've got the ball in my hand and I'm on that mound, that's my mound." And via the Times' Bats blog: "If my grandmother ran across the mound, she would have heard the same thing he heard — period. That's the way I handle the game and the way I handle myself on my workday. That's just the way it is. I would never disrespect anybody like that." "He's right, I don't even have a handful of wins. I have three. 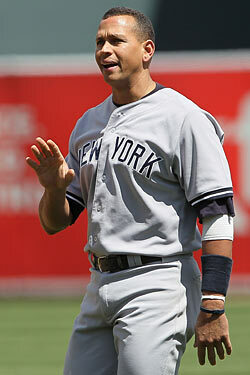 Do the math A-Rod." "I don't go over there and run laps at third base. I don't go over there. I don't spit over there. I don't spit over there. I stay away. You guys ever see anybody run across the mound like that? He ran across the pitcher's mound, foot on my rubber. No. Not flyin." "The long and short of it is it's pretty much baseball etiquette. He should probably take a note from his captain over there, because you don't run across the pitcher's mound in between an inning or during the game. I was just dumbfounded that he would let that slip his mind." "If he wants to run across the pitcher's mound, tell him to go do laps in the bullpen." "I'm not really a speck on that guy's radar but he'll know after today that it might not be a good idea to run across the mound when I'm out there. It's not like I throw 95 (mph) and I'm going to hurt him. He'll know I was there, though." "The guy was tasting himself too long to apologize. No, he didn't apologize. And it's a shame. I have a lot of respect for that guy, everything he's done in the game. It's just disappointing when you see the other side of things." Yikes. So many things to say. For example, we've followed Derek Jeter since he was a rookie, and we had no idea until now that he had a reputation as a guy who didn't step on pitchers' mounds. And if A-Rod were to run laps in the bullpen, wouldn't that be disrespectful to the relief pitchers? Or does this imaginary rule only apply to mounds between the baselines? (Or perhaps it would be okay if he did laps in the Yankees' bullpen?) Also, "the other side of things" makes this seem like an awfully dark situation and not some pitcher with a career 17–21 record (albeit a 3–0 record this year) trying to get mentioned on PTI tonight. A-Rod didn't seem terribly fazed by any of this, saying he found it "pretty funny" and he had no idea what he'd done wrong. He also didn't exactly take the high road: When first told of Braden's comments to reporters, A-Rod — who'd waved his hand at Braden after the inning as if to say "get off the field" — asked, "Who said that?" Upon being told it was Braden, he replied, "Exactly. Exactly."